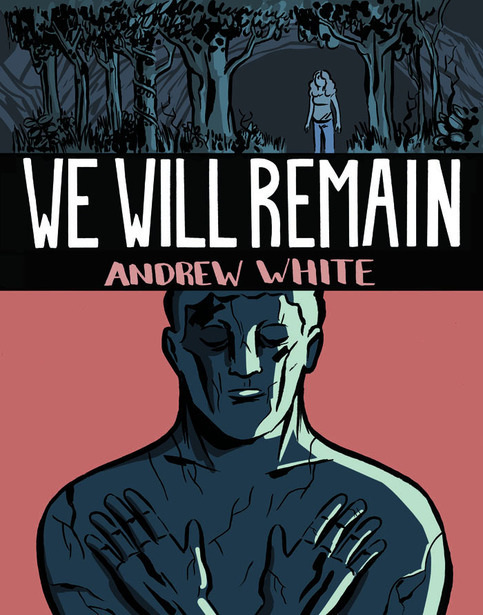 We Will Remain collects five short pieces by Andrew White. Three of them are more or less stories, and two are closer to the realm of comics poetry. As a narrative writer I was naturally drawn more to the stories. I especially liked the last story in the collection, the title story, about a statue built 10,000 years ago and how it survives to the present day before it is destroyed to make way for a freeway, and then about the monuments our civilization will leave behind when it is gone. You can see White experimenting with his art in different ways over the course of the book. He likes to manipulate things digitally so that the backgrounds show through characters’ faces. That works to best effect in the middle story about a woman who builds herself a little garden hideaway in a cave in the woods. A couple of preview pages available at the Retrofit link above. Process pages on White’s Tumblr.